Early cinema was less a known quantity bolstered up by professionalism and stately film-making than a playground of pure delight, a cavalcade of wonders experiencing the birth pains of newness to the world. In place of a defined set of filmic rules, men and women were free to exploit the unease of the medium to create works of wonder and awe that looked to all inspirations and mashed them together with cheerful abandon. Silent cinema, when traditional narrative film-making was still finding its legs, was a time of wild-man exploration, when film could descend to the pit of man’s fears and the heights of human desire. And all without too much of a pesky plot to get in the way. Fittingly, the genre that saw the greatest fruits for silent cinema was horror. Horror was never particularly well fitted to narrative – perhaps tellingly the genre found its greatest and most consistent prestige during the silent era. A focus on story often only had the effect of distracting from the more primal, primordial haunted imagery and the raw, viciously oppressive direct sensation of experiencing a screen of demented wonders. Silent horror was a place for audiences to directly address the screen, to confront images placed before them, and for those images to imbue themselves less onto the thinking mind than the unconscious one. While it wasn’t busy trying to make logical sense, silent horror found time to capture the human soul in all its facets, laid bare and split open uncomfortably and given to us on a silver platter. Even when they don’t scare, silent horror films provoke in untold ways that often can’t be described through written word. To this extent, here are fifteen of the greatest silent horror films. Let’s get this out of the way: German Expressionism and shadows had a special relationship. 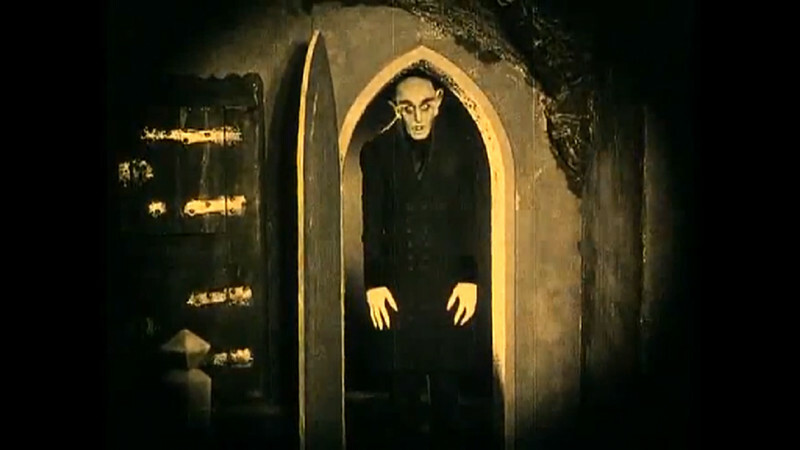 While many films, such as the more famous Cabinet of Dr. Caligari and Nosferatu, utilize shadows for untold wonders, never before or after has a film made the act of shadow-play its prime goal like Warning Shadows. Among other things, its title is utilitarian – it captures exactly the film’s ethos like few others, that of shadows which serve to warn us of future despair. The film, about a shadow-puppet master who uses his talent to spin moral fables about a series of guests gathered for a will reading, reveals its intent in its title. The film opens with a statement to this effect. We get a blank stage, done up in a yellow tint so as to appear inhumanly bright. Soon enough, the giant shadow of two hands appears and gives way to the shadow of a man. We then see the man in detailed, human form, with the shadow still looming behind him, before he returns back to the enigmatic, abstract state with which he was introduced to us. Several more character introductions open the film, all preceded by explicit text introducing the characters in the requisite vague terms populating morality plays; “the man”, “the woman”, “three gentlemen”. It’s all there in the shadows: the sense of human abstraction, the stark morals, the soul-sucked malaise. And, in the stage and the inter-titles, we have the profound artifice of the whole affair, the fact that this is a storybook or a tall-tale to spook you. And we have, in the shadowed hands, the storyteller behind the scenes, introducing us to his tale with all the pomp and circumstance he can muster. He wants to spook us, and he wants to let us know that it is he who is doing the spooking. The sublimely theatrical beginning tells us all any director could ever want: this is my film, gaze at my images, and be amazed. If German Expressionism, and in some sense the roots of horror cinema, were all about shadows, Warning Shadows is its ultimate manifesto. Take the ghoulish carnival campiness of the more experimental silent horror films, sand some of the rough edges down into narrative form, and pervert the whole thing into twisted comedy, and you have a good idea of The Cat and the Canary. Directed by Paul Leni (forever doomed to the shadows of Murnau, Lang, and others) after he ventured to the US but before making his career-best The Man Who Laughs, the film re-reads German Expression and stops just a touch shy of openly mocking it. One of the very first “bunch of people get together for the reading of a rich-and-dead person’s will and then get all greedy and do what relatives of rich people do best” films, it’s far more cheeky than serious. That the film realizes the silliness of the whole affair is all well and good, especially because, visually, it’s a noticeable step down in quality from some of the other silent films being produced around this time. The moving camera was already in full effect by 1927, but the film mostly sticks to a still frame. When Leni does flex his muscles, it’s a grand success – a few subtle camera shifts work on such a subliminal level as to disconcert and perturb while remaining almost noticeable. It’s as if the camera warbles and quavers at the sight of some unseen spook. But it’s Leni’s generally over-the-top self-reflexive poking fun at the whole mystery genre and the increasingly narrative world of late 20’s cinema that earns the film its stripes. The whole affair is rather intentionally stilted, with characters mugging for the camera and title cards exasperatingly stating too-dramatic, huffed-up lines. Things go awry in suitably stuffy fashion, with Leni at least once superimposing shadow over shadow to poke at the histrionic use of shadow-work in expressionist film. The Cat and the Canary isn’t a great horror film, but it is an influential one, being one of the earliest Universal horrors and setting up untold rules for their later, more famous works. In its own dry way, too, it’s endearing as a bit-of-the- ol’ un-substantive fluff. One of the more famous silent films, this 1925 adaptation of The Phantom of the Opera is most recognizable due to Lon Chaney’s flamboyant, theatrical performance perfectly fitted to the main character, an aching madman who channels his nightmares into wildly grandiose theater performance for audiences to bask in. The only difference: his “performances” are the backstage ramshackle killings he stages to terrorize and exert power over the opera community. He literally earns an audience in blood. Lon Chaney aside though, the film’s imagery is in perfect unison with its narrative, and its main character. The opening shot is categorically expressionist, giving us a frightened man hunched over in the midst of a shadowed arch, only to move to the left as he’s engulfed by the negative space of the darkness surrounding the arch. In his place emerges an immense shadow in the light of the archway, now engulfing it in darkness. It’s the perfect metaphor for expressionist film-making, and horror: darkness engulfing even that which was at its brightest, and leaving nothing in its wake. Best of all, the film rather wonderfully blends all of this to the conceit of the theater– the most interesting theater, and the one which fascinates the film’s diegetic audience most, is undoubtedly the Phantom’s murders. They are a great form of entertainment for the film’s characters, a theatrical form, and as grandiose and “staged” an entertainment as anything else. The Phantom, for his deformity, can’t be on the stage, so he turns others’ eyes toward him in the only way he knows how. The Phantom himself moves less like a human than a performance, or a stage-prop, as if having the capability of motion only so that he can move himself to the scariest, most self-indulgent static positions he can possibly find. He’s less person than a distilled image of horror, having been made so by his failed humanity (he has self-consciously fashioned himself as a horror “character” in this regard). Having failed at being a human trying to be a performer, he decided to cut out the middleman – now he’s all performance, all image, and all theatrical construct, and nothing human. Thus, the film bleeds an exploration of the duality of life and performance and the way the latter subsumes the former – the fact that the Phantom’s true face looks more like the Red Death theater mask he puts on to attend a costume ball in the film’s most chaotic scene (which is colorized to look like a grandiose, theatrical stage performance) is just the most obvious example. The backstage of the film looks and plays like a distorted, obviously stagey madman’s maze of constructed wonders, something a theater performer might make the best use of. In fact, a performer did – the Phantom uses them and gives them an audience, his victims, and us. As a commentary on the madness of performance, the audience gaze, and the fakery of showmanship, The Phantom of the Opera retains the power to chill the bone today. Buster Keaton’s 1921 reworking of Melies’ earlier film by the same name (as well as the entire “Old Dark House” genre for that matter), The Haunted House is an early masterpiece of pure carnival spooks and madman revelry from a pre-auteur who would go on to even greater things. Although this twenty minute feature begins with a first third that is hardly horror (even then, the pratfalls of a bank teller (Keaton) as he deals with money glued together and, soon enough, to everything, is an undeniable treat), the last two thirds of the film more than make up for it. Keaton enters the “haunted house” rigged up to induce fright by a gang of bank robbers who call the place their hide-out, and things go to all hell with madcap, lunatic-binge fright. As Keaton tries to make sense of the situation, the robbers introduce him to all manner of ghosts, ghouls, and goblins to frighten him off in some exquisitely timed physical comedy (things get more imaginative too, such as a wonderful bit where two skeletons put together a man from dissembled parts). Wholly indebted to the non-logic of slapstick and watching Keaton interact with and avoid these various pratfalls, few films have as much to say about the raw physicality of human motion. Beyond this, though, the film also lightly mocks the horror genre for its put-on spooks and its fantastical silliness (revealing, as it does, that the whole “haunted house” idea was just a lie) even as Keaton upholds the genre for the undeniable entertainment it still represents (put more simply, just because the skeletons are men in costumes doesn’t make them less fun to watch). Late in the film, when Keaton begins to dream about heaven and hell in decidedly similar terms to the parade of horrors he just witnessed, he explores both how horror is all a bit nonsensical and silly and that it still manages to work, and to imbue itself onto our unconsciousness, for precisely these reasons. If Melies’ film was us laughing at death and death laughing back, this is Keaton’s stoic, stone-faced retort and him having a ball in the only way he knew possible. The Fall of the House of Usher, an early Poe adaptation, is not only horror, but one of the cinema’s first unabashed art films. While future Poe adaptations would come, what matters for 1928 is how gosh-darned stunningly artistic and exasperated this film is in its realization of pure expressionist dread. By 1928, the cinema world was very much in the post-expressionist phase of it’s being, with American cinema almost ready to move to film noir (a somewhat muted descendant of the purer expressionist form, adapted for more conventional, narrative cinema). And some of that shows here – the violent use of superimposition speaks to the hazier work that would be seen in the likes of Murnau’s Sunrise and Dreyer’s Vampyr. But elsewhere, this is a rather stunningly distilled and unaffected blast of the purest form of cinema carnival-horror, with a constantly moving camera, rotating and spinning frames, piercing shots, high contrast color, and all manner of ethereal, decrepit darkness on display for all to see. Even by expressionist standards, this film is rather openly artsy – witness the delirious, exciting abstraction of a scene where a character walks off of something that approximates human landscape and into a pure, soul-deep black canvas. Or a moment when a hand is superimposed onto a background of crossed lines and triangles as it hurtles toward the screen, clenching it’s fingers into a fist and, with the triangles all about, giving the impression of breaking through the celluloid and leaving broken glass. Fittingly, this is our window into another world, a filmic one, and one of the mind, and it’s all rather openly interested in artifice at that – floaty text appears on the screen and dances about in heated fever, and it all opens with a kaleidoscopic display of copies of “The Fall of the House of Usher” ravaging all about. Some shots are filtered through prisms of light for maximum distortion, and the prism is literally shown on the screen, putting a final stamp on the end of an era of film that openly flaunted its own filmic-ness. Truly, this is one of the great cinematic tone poems, but it is a madman’s version of the form – this is chaotic, oppressive cinema at its most giddily transcendental, with just about every shot boasting some new fascination shoved into our faces for full effect. As the film rises and boils to a threatening climax, with shots literally superimposed onto each other and clashing like swords in a sabre dance, the effect is nothing short of awe-inspiring. Tiring and exhausting, yes, but awe-inspiring.